HitGuns.com would like to introduce a new line of gas revolvers. This revolver features a compact 4 in barrel with fully adjustable rear sites. Powered by your choice of gas it produces an awesome 280 Fps on .2g B.B.s. When holding the gun you will immediately notice the heavy weight metal construction. The ergonomic grip makes the gun feel as though it was part of your hand. The dual action design allows for semi- automatic firing. Realism was taken to the next level with 6 mock bullet shells that can be loaded in like a real revolver. 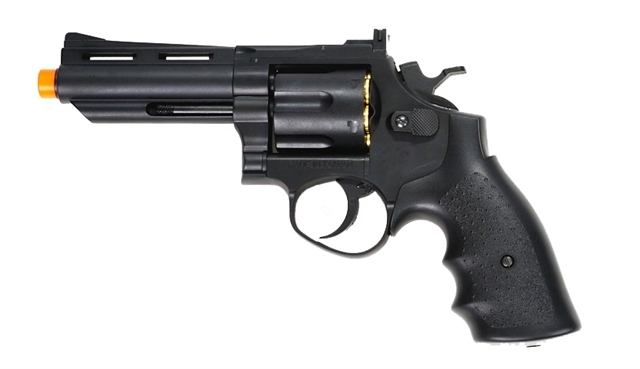 This revolver is perfect for that airsoft enthusiast or collector. Comes in a black finish with contoured black grips.